There are numerous indicators that point to the South China Sea as an increasingly conflictive region in the world. South China Sea Consulting aims at facilitating the dialogue amongst the different players involved in this escalating multi-dimensional conflict. This is be achieved by mapping their different territorial hard and soft claims, which will facilitate the identification of possible negotiable regions. In addition to mapping the different basic territorial claims, SCSC dissects the political, economic, and military dimensions of the conflict that influence any negotiation process. The territorial claims flexibility will be greatly influence by the way how these three dimensions are addressed during the negotiations. By simultaneously adjusting the mapping of the different territorial claims to the political, economic, and military dimensions, one can expect that the negotiations will more flexible and constructive, and that the agreements will be more representative of each party's expectations. Cracking of the Sino-Indonesian Partnership? Jakarta is alarmed by China’s claims that it has undeniable historical fishing rights in the Natuna Islands (NI) territorial waters as they undermine Indonesia’s territorial sovereignty. Our analysis loosely adopts the securitization conceptual framework and uses a combination of quantitative and qualitative methods to reveal that Jakarta swiftly securitized the NI issue between 2014 and 2016. The results show that until late 2014 the NI were discussed almost exclusively in cultural, social, and economic terms. Then, by the end of 2016, the Indonesian media portrayed China’s claims that it has historical fishing rights in the NI territorial waters as the most urgent national security threat to Indonesia, i.e., the NI issue was securitized. Analysis of discussions in several Indonesian social media outlets shows that the Indonesian people have accepted Jakarta’s security discourse. Currently, Jakarta’s and Being’s assertive security discourses indicate that the longstanding Sino-Indonesian partnership might be cracking. The power of discourse is to render “right”, “legitimate”, “taken-for-granted”, “natural” specific ways of knowing, acting and organizing social life. More precisely, it makes “real” that which it prescribes as “meaningful”. Crucially, this rendering of “right’ silences other possibilities (Fetherston 2000, 190). In the last two decades, disputes in the South China Sea (SCS) have grown both in number and intensity despite the different relevant state actors communicating extensively to mitigate them. At the core of the disputes are the overlapping territorial claims that primarily pit China (and Taiwan) against the Philippines, Vietnam, Malaysia, Brunei, and, to a lesser extent, Indonesia (Figure 1). China has been physically changing the SCS realities and producing an increasingly assertive discourse to legitimize and render indisputably right their territorial claims and silence those put forward by the rest of the claimants. President Xi Jinping’s “Chinese Dream” campaign aimed at reviving China’s past glories and world status, and it has reinvigorated this assertive discourse and made it more antagonistic. This is because one of the foundations on which the Chinese Dream flourishes is the preservation of China’s territorial integrity, which includes Taiwan, Diaoyu/Senkaku Islands, and the area within the nine-dash line in the SCS. Reasserting China’s control over these territories is seen as a sacred duty by the Communist Party of China (CPC) that has to be successful, even if it entails military confrontations with other state actors (Wayne 2008). Furthermore, as a rising economic and military powerhouse, China argues that its sovereignty over these territories is 100% legitimate and indisputable, leaving no negotiation space for the competing claims of other state actors. More crucially, Beijing’s assertiveness has woken up a dormant conflict with Jakarta, its closest ally in the region, over the sovereignty of the Natuna Islands (NI) territorial waters that now threatens to erupt into an outright military confrontation. Until recently, despite some tensions resulting from competing territorial claims, Indonesia declared itself as a non-claimant state in regards to the SCS disputes, offered to be an honest broker in these disputes (Heiduk 2016, 34), and followed a China-friendly domestic and regional approach. This positive attitude was reflected, for instance, during Indonesia’s ASEAN chairmanship in 2011, when the Indonesian administration endorsed an increased ASEAN integration with China (Aplianta 2016, 16-17). This China-friendly attitude has been increasingly undermined by Beijing’s claims that some of the NI territorial waters are indisputably part of China’s traditional fishing grounds. Therefore, China feels entitled to send its fishing fleets and modern coast guard to the region. Beijing’s claims are based primarily on questionable historical evidence, which is neither recognized by Indonesia nor the UNCLOS. Indonesia has already rejected Beijing’s maritime claims in a muted manner, such as after an incident in the NI in June 2010 when Jakarta declared that the Chinese had ‘no clear explanation as to the legal basis’ for their territorial claims delimited by the nine-dash line, which clearly contravenes the UNCLOS 1982 (Supriyanto 2012, 1). However, more recently, Indonesia has become more assertive about its stance concerning the SCS disputes, with declarations such as those made by former Indonesian President Widodo in an interview with the Yomiuri newspaper: ‘China’s claims to most the South China Sea has no legal basis in international law, but Jakarta wants to remain an ‘honest broker’ there’ (Widodo 2015). While trying to remain on good terms with China, the Indonesian government and military became increasingly worried about China’s assertive presence in Indonesian territorial waters and the resulting regional instability that this presence produced (Moeldoko 2014). Given that the NI spread across 262,000 square kilometers of water, they represent a major logistical challenge for Indonesia to monitor and control effectively (Supriyanto 2015, 1). Besides the rising tensions between Indonesia and China, other regional state-to-state tensions were worsened due to events, such as a rise in armed robberies and violent attacks in ports and waters along the coasts of the Philippines and Indonesia. These incidents fed off rising insecurity and growing conflicts between neighboring states over marine resources, territorial sovereignty, and maritime jurisdictions (Morton 2016, 4), ultimately leading to popular anti-China protests in Indonesia, Malaysia, the Philippines, and Vietnam (Beckman and Clive 2014). Taking into consideration this multi-national and multi-dimensional background, this paper has two objectives. First, to provide an analysis of the Indonesian mainstream printed media involving the tensions around the NI to show that between 2013 and 2016 a swift securitization has occurred. Second, to survey popular social media outlets to assess whether Jakarta’s argument that China’s claims represent an urgent national security treat for Indonesia has been accepted by the Indonesian people. Before proceeding to present the findings and discussion of this research, it is important to describe the conceptual framework and methodology used in this paper, and situating Jakarta’s discourse in its context to ensure that its interpretation reflects the intended meaning. To achieve its first objective, the description of the securitization of the NI issue by the Indonesian government, this paper loosely adopts the Copenhagen School’s (CS) ‘securitization’ model and uses Critical Discourse Analysis (CDA) to unpack the Indonesian mainstream printed media covering the news involving the NI. Here, the term ‘securitization’ is primarily used in the sense of the social-constructivist discursive approach to security given to it by the CS, which argues that the securitization of issues allows state actors to discursively transform non-security issues into security ones and if deemed necessary, to legitimize extraordinary measures (Buzan, B., Weaver, O. and Wilde, J. D. 1998, 25). To date, a large and growing body of literature has used CDA to understand the political processes in democratic countries (Fairclough 2005) and in some non-democratic countries (Krause, K. and Willias, M. C. 1997). Linguistic approaches, such as content, metaphor (Chilton 1996), illocutionary (Vuori 2008), and traditional journalistic text analysis (Richardson 2007) in particular, are effective for the purpose of this research. CDA offers a methodological framework that considers both textual and contextual sources, and allows for a dynamic interaction between the discourse and its audiences. Among the eclectic methodologies proposed in the literature on CDA, this work follows the adapted version of Fairclough’s method proposed by Richardson (2007) to make it more effective for analyzing newspapers. Fairclough’s method facilitates the ‘analysis of relationships between concrete language used and the wider social cultural structures and offers an effective model to define the relationship among three levels of discourse analysis: the actual text, discursive practices, and the larger social context’ (McGregor 2003). In summary, this work uses CDA and follows the securitization model proposed by the CS to dissect Indonesia’s security discourse involving the NI to answer a number of key questions – who securitizes, what is securitized, why and how is it securitized – and to evaluate the degree of acceptance by the different audiences (Buzan, B., Weaver, O. and Wilde, J. D. 1998). To reveal the securitization process of the NI issues, the analysis describes the evolution between 2013 and 2016 of four constituent elements of the securitization model proposed by the CS – securitizing authority, referent objects, existential threats, and extraordinary measures. Securitizing authority refers to institutions, organizations, or individuals that have the status and the credibility needed to legitimately discuss security matters. The terms ‘threat’ and ‘existential threat’ are used in the analysis to describe issues that are explicitly or implicitly labeled as such by the securitizing actors, independently of whether they ‘really’ do represent threats or not. Similarly, the term ‘referent object’ is used for objectives that Jakarta describes in its discourse as fundamental for the Indonesian people and state, such as, for example, economic development and national security. The fourth constituent element describing the securitization process refers to the ‘extraordinary’ measures implemented by Jakarta to deal with the tensions in the NI waters. There were four selected-newspapers that represent official and influential publications, namely Kompas as an Indonesian language-national influencing public opinion newspaper and The Jakarta Post and Jakarta Globe as English-national newspapers, while Antara news is a government news outlet. The second objective of this research, to assess if the securitization has been successful, is achieved by surveying the different Indonesian social media outlets and identifying how the popular voices changed over the same period, from 2013 to 2015. The audiences that Jakarta’s security discourse targets can be divided into two major groups depending on their distinct reaction to the discourse (Balzaq 2005): domestic and international. The domestic audiences can be further subdivided into the political-elite, intellectuals, and the general population, and the international audience can also be further subdivided. However, due to time and space limitations, this work only focuses on Jakarta’s dominant audience, the general Indonesian population. To develop an understanding of how Indonesia’s public perception of the NI issue evolved between 2013 and 2016, numerous Twitter and Facebook accounts were surveyed, including @MailOnline, @Kompascom, @Jakartaglobe, @diplomatmegazine, and @abcnews. Keywords, such as tourism destination, underdevelopment, travel, territorial dispute, sovereignty, illegal fishing, and threat, amongst others, were used to identify relevant tweets and discussions. The coding scheme was divided into three descriptive categories: negative, pressure, and neutral/positive. Furthermore, given that the collocations of a target word can provide valuable information about semantic preferences attached to it, the collocation lines for “Natuna” were coded into three categories: (1) Negative Description, (2) Description of Pressure, and (3) Neutral/Positive Description. NodeXL was used to examine the frequency with which “important” words were used in the social media, allowing the identification of the patterns of the use of relevant words over a given period of time. To be able to interpret the discourse that the Indonesian media produces in the same way that Indonesians do, it is necessary to provide some context to the text that we are going to analyze. That is, we need to briefly “situate” the discourse (Richardson 2007). At any moment in the development of the dialogue there are immense, boundless masses of forgotten contextual meanings, but at certain moments of the dialogue’s subsequent development along the way they are recalled and invigorated in renewed form (in a new context). Nothing is absolutely dead: every meaning will have its homecoming festival (Stritzel 2011, 346). Discourses shape and are shaped by the environment in which they develop (Richardson 2007), and they are made significant by their embeddedness in their ‘social relations of meaning and power’ (Stritzel 2007). Hence, to be effective, any CDA has to take into account the values, principles, and recent events in which Jakarta’s security discourse involving the NI is embedded. Given that Indonesia’s perceived threat to its territorial sovereignty in the SCS comes from China, it is useful to briefly describe Beijing’s stand on the NI issue. In his oath for office, Sun Yat-sen, the ‘Father of the [Chinese] Nation’ and the Republic of China’s first president, called for China’s territorial and peoples’ unification, the unification of the Chinese nation (Yat-Sen 1981, 2). President Sun Yat-sen’s call for unity implicitly recognized that, at the time, the peoples to be blended within the new Chinese nationality had their own distinct ethnic identities and that the territories to be included in the Chinese state were not united. To bond these territorial and ethnic fractures, the Chinese leadership had to undertake intensive state and nation building efforts, efforts in which, since the founding of the new China in 1949, the CPC has been mostly successful (P. Meyer 2012). When it comes to China’s control of the areas that it claims in the SCS, it was weak during the first fifty years after the New China was formed. In recent years, however, the CPC has become much more assertive about its claims in the region and has taken actions, such as building islands to reinforce its position there. If Beijing’s official discourse involving the SCS disputes is to be understood literally, which we should because China is not flexible about its territorial claims, then it becomes clear that many of its claims are irreconcilable with those of other state actors, including Indonesia. Whether from the perspective of history, geography, or international law, the Nansha (Spratly) Islands, Shisha (Paracel) Islands, Chungsha Islands (Macclesfield Bank), and Tungsha (Pratas) Islands, as well as their surrounding waters, are an inherent part of ROC territory and waters. The ROC enjoys all rights over them in accordance with international law. This is indisputable (ROC 2015). Identical claims are made by the “other” China, the People’s Republic of China (PRC). Another example of two obviously irreconcilable discourses occur between the PRC and the Philippines. A PRC Foreign Ministry spokesperson argued recently that ‘China has indisputable sovereignty over islands in the South China Sea and the adjacent waters’ (Can 2016). In addition, the Chinese Foreign Minister declared that ‘China cannot accept Philippines' claiming sovereignty over some S China Sea islands’ (Xinhua 2011). China’s claims to sovereign rights and jurisdiction, and to “historic rights”, with respect to the maritime areas of the South China Sea encompassed by the so-called “nine-dash line” are contrary to the convention and without lawful effect to the extent that they exceed the geographic and substantive limits of China”s maritime entitlements under UNCLOS (Guardian 2015). If the PRC/ROC claims were to be understood literally and as final, which they should, then all the other countries affected would have no reason to engage in negotiations and a military confrontation would be unavoidable. To conduct the discourse analysis of how the NI issues were discussed by the Indonesian mainstream media, the following four prominent Indonesian newspapers were used: Kompas in Indonesian, The Jakarta Post and The Jakarta Globe in English, and Antara News in Indonesian and English. The focus will be on the news related to the NI that appeared in these news outlets between 2013 and 2016. As shown below, this analysis clearly indicates that during this period the tensions with China in the NI were securitized. Then, to assess the success of this securitization, two prominent social media outlets, Facebook and Twitter, were surveyed to identify how the Indonesian public’s opinion evolved between 2013 and 2016. Except on a very few occasions, in 2013 and 2014, Indonesia’s discourse involving the NI did not have any significant security dimension to it, providing an ideal neutral reference point to explore if securitization occurred in subsequent years. During these two years, the NI was discussed in economic, cultural, and tourism terms. An example of such discourse are the declarations of Dahlan Iskan, Minister of State Enterprises, when he visited the Natuna and Anambas Islands to promote them as international tourist destinations (Kompas 2014). In addition, the relationship between Indonesia and China was predominately friendly, which was reflected in the presidential telephone conversations between the Chinese and Indonesian Presidents, in which both expressed their desire to strengthen their strategic partnership as ‘good neighbors and good friends’ (JakartaGlobe 2014). The positive Indonesia-China relations and, more significantly for this research, the fact that the NI were not considered a security issue is clearly reflected in the fact that the four newspapers that were surveyed by this research published on average only one article per month discussing politics or security in 2013 and 2014 (Figure 2 and Figure 3). Figure 2: Natuna Islands news 2013. Figure 3: Natuna Islands news 2014. There were, however, several news items discussing the alleged illegal fishing activities by Chinese vessels in NI territorial waters (G. Galiartha 2014) and the need to develop the economy of the islands to prevent other countries from occupying them (Aritonang 2014). A significant event that resulted in Indonesian officials showing concern over China’s intentions in the SCS was when Beijing redefined its nine-dash in March 2014. This latest version of the nine-dash line includes part of the NI territorial waters. 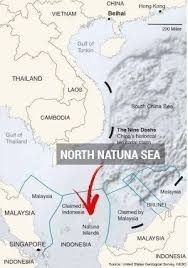 While this was a very important and alarming declaration by Beijing, it was only mildly reported by Antara News under the headline ‘Indonesia has conveyed objections to the Natuna map’ (Panca 2014), indicating a cautious approach by the Indonesian side. As it can be observed in Figure 3, by the end of 2014 the number of articles discussing politics and security issues started to increase, indicating that Indonesia’s China-friendly approach was starting to fade away. In October 2014, the Jakarta Globe discussed on three occasions security related issues, with headlines such as ‘SBY Tells Troops: Indonesia an Asian Tiger in Ten Years,’ demanding Indonesia’s military buildup to face up to China’s challenges (JakartaGlobe 2014) and ‘Chinese claims over the Spratly Paracell and Maritime Security Threatens Indonesia’ (Buol 2014), explicitly discussing China as a threat to Indonesia’s interests in the SCS. This more antagonistic discourse was further intensified in 2015. Following the trend that started to emerge in late 2014, in 2015 Indonesian officials increasingly discussed the NI issues in the context of national sovereignty and security, and became more vocal and assertive about protecting them. Thus, the number of Indonesian news reports that discussed political and national security involving the NI and their adjacent territorial waters increased significantly in 2015 (Figure 4). For instance, Indonesia announced plans to build more military posts in border areas to safeguard the archipelago's sovereignty and territorial integrity — especially in areas facing the SCS. The Indonesian National Development Planning Minister, Andrinof Chaniago, said he was working with the Defense Ministry on a comprehensive defense plan to be presented to President Joko Widodo (JakartaGlobe 2015). Figure 4: Natuna Islands news 2015. Like in 2014, the number of security-related articles run by Indonesian news outlets gradually increased and peaked in late 2015. Moreover, the articles also became increasingly explicit and assertive in their statements, such as under the headline in Kompas ‘14 the Indonesian navy warships watch in the south china sea’ (Hakim 2015). In this news piece, the First Admiral TNI M Zainudin confirmed Indonesia’s naval deployment in NI territorial waters, but, in an effort to avoid an escalation of the tensions, denied that the deployment of the warships was due to a conflict: ‘We have no conflicts in the South China Sea. We are just protecting the sovereignty of and defending the Republic of Indonesia’ (Hakim 2015). By the end of 2016, Indonesian newspapers and, as shown later, social media extensively discussed NI issues in political and security terms, arguing that Indonesia’s sovereignty over the waters surrounding the island was not negotiable, not even in the case of China. This is reflected in the fact that during 2016, the Jakarta Post and Kompas published, respectively, 105 and 96 news reports (Figure 5) addressing Indonesia’s security concern over Beijing’s challenge of Indonesia’s sovereignty over the NI territorial waters. Figure 5: Natuna Island news 2016 (note: different scale than previous figures). The first mistake, the Chinese coastguard vessels violated Exclusive Economic Zone (EEZ)… Furthermore, Chinese coastguard vessels violated Indonesia’s law enforcement exclusive rights in Indonesia’s EEZ… Lastly, the Chinese coastguard vessel violated Indonesia’s territorial sovereignty (Kompas 2016). These are serious and explicit accusations that illustrate the magnitude of the confrontation between Beijing and Jakarta involving the NI. In addition, Jakarta did not just make accusations, but also took actions to make sure that Beijing would take good note of its stance. Indonesia’s Foreign Minister, Retno Marsudi, met Chinese embassy representatives in Jakarta to express Indonesia’s dismay about the incident and clarify ‘that the Natuna waters are constitutional Indonesian territory’ (F. J. Kuwado 2016). To ensure that the entire world (BBC 2016), and China in particular, would understand that Indonesia was not willing to negotiate the sovereignty of the NI, one week after the incident with the Chinese coastguard, President Jokowi held a cabinet meeting with ten miniters and numerous high-ranking officials on an Indonesian navy ship in the NI territorial waters (Djumena 2016). During this meeting, President Joko Widodo expressed his intention to do everything that was needed to safeguard Indonesia’s national integrity as well as its maritime rights from China’s aggressive incursions (Morton 2016). Until late 2014, the NI had been mainly discussed by the mainstream Indonesian media in economic, cultural, and tourism terms, and then, in 2015, they were increasingly addressed as being a security challenge due to China’s ambitions in the region. By 2016, the Indonesian media discussed the NI as an urgent geopolitical and national security matter, i.e., the NI issue had been securitized. For the securitization to be considered a success, it is necessary to confirm that Jakarta’s main audience, the Indonesian people, had accepted their government’s argument that China’s claims to the NI had become an urgent national security matter. To identify how the Indonesian public’s opinion evolved between 2013 and 2016 in response to Jakarta’s security discourse, numerous relevant Facebook and Twitter entries and discussions were surveyed. Two clear trends appear when the number of tweets for each keyword are plotted over the period between 2013 and 2016 (Figure 6). The first trend is that positive description keywords, such as tourism are dominant in 2013, but rapidly decrease in 2014 and 2015, and have almost vanished by 2016. The second trend is the opposite of the previous one, with negative and pressure description keywords, such as illegal fishing, being extremely rare in 2013, but then rapidly increasing in late 2014 and 2015, to become the dominant ones in 2016. As discussed below, these two trends strongly indicate that by 2016, Jakarta had successfully convinced the Indonesian people that the Chinese aspirations in the NI waters represented an urgent national security threat, i.e., Jakarta had successfully securitized the NI issue. Figure 6: Twitter and Facebook trends from 2013 – 2016. Indonesia-China relations have been characterized by ‘persistent ambivalence’ resulting from two conflicting perspectives (Laksmana 2011, 24). One of these perspectives is positive and is held by the Indonesian political and economic elites, who expect that China’s growth and expansion will also bring development and stability to Indonesia. Besides the numerous traditional trading exchanges, Indonesia supplies China with large amounts of raw materials and China provides all kinds of finished products to Indonesia and, more importantly, funding for and help executing numerous massive and urgently needed infrastructure projects, such as harbors, airports, and railways. The Jakarta-Bandung high-speed railway, which was awarded to China instead of Japan in October 2015, shortly after President Jokowi took power (Setijadi 2016, 12), is just one of these numerous multi-billion dollar projects. The second is a negative view, resulting from the fact that China’s growing influence in the region also brings economic, cultural, and, more importantly, security challenges to Indonesia (Wong 2015, Laksmana 2011). The current tensions between Indonesia and China involve Jakarta’s view that Beijing’s claims that part of the NI territorial waters are historically Chinese fishing grounds directly infringes on Indonesia’s sovereignty and are illegal. The Indonesia-China legal battle for the NI is about maritime borders, which play a crucial role in persevering the national security of states (Liss 2013). However, state definitions of what is deemed illegal are often situational and inconsistent, depending on changes in government administrations and policies (Eilenberg 2012). This legal flexibility might be one of the tools to be used in managing the current tensions in a constructive manner. It is the recent significant intensification of China’s verbal and physical assertiveness in this complex power and legal confrontation that has forced Jakarta to break its silence and leave its long-held position of ‘honest broker’ (Marguerite 2016) to join the resistance to China’s expansion in the SCS. One dimension of this confrontation is played out in the printed media of both countries. In this discussion, we will focus on Indonesia’s mainstream media, whose security discourse is subordinated to that of the Indonesian political and military elites, resulting in them playing the role of mouthpiece of for the Indonesian government as far as the security discourse is concerned. This discussion will show that the Indonesian government’s discourse involving the NI changed fundamentally from describing them in economic, cultural, and tourism terms in 2014, to arguing that they had become an urgent national security matter by the end of 2016, reflecting a swift securitization of the NI. To show that this securitization has indeed happen, this research uses a combination of quantitative and qualitative methods to compare the number of times the Indonesian mainstream media ran articles discussing the NI in economic, culture, and tourism terms versus how many times it did so discussing them as security matters. Figure 7 illustrates the number of security-related articles per month published by four major Indonesian news outlets: Antara News, Kompas, The Jakarta Post, and The Jakarta Globe. The data clearly shows that in 2013 and 2014, the NI were practically never addressed as a security matter. The few cases when security was discussed, it was done without giving it a sense of urgency or criticizing China. Such an article was published in The Jakarta Post under the headline ‘Govt takes small steps to protect Natuna’ (Aritonang 2014), where the issue was to protect Indonesian economic interests in the region. Figure 7: Securitization of Natuna Island between 2013-2016. The NI were, however, extensively discussed in economic, cultural, and tourism terms. For example, the secretary of the Natuna Development Planning Board, Mr. Kadarisman, told The Jakarta Post under the headline ‘Tourism key to success for Natuna and Anambas’ that the local administration was aware that there was a need to further promote the tourism potential of the Natuna and Anambas Islands (JakartaPost 2014). The need to economically develop the NI was discussed in the media for two main reasons, with the first being the need to provide better living conditions to the local population. Ranai, the largest town in Indonesia’s remote and sparsely populated Natuna archipelago, with a few cars in its streets and only two sets of traffic lights, could be best described by the word ‘sleepy.’ The nearby beaches lie pristine and empty, waiting for tourists to come and enjoy them (Jakarta Globe, 2014). Hence, there was a huge tourism and economic potential that remained untapped and needed to be activated. The other reason that the NI were discussed in economic terms was the fact that this resource-reach region was underdeveloped and Indonesia was deprived of the benefits that a proper exploitation would bring to the country. Then, in 2015, following a significant increase in Beijing’s verbal and physical assertiveness in the SCS, the Indonesian government became more vocal about its security and sovereignty concerns. China claimed most of the SCS – open waters, land formations, and seabed – and, more significantly, changed the facts on the ground by building islands where only sand bars and shoals existed. On three of these island, Beijing has constructed large airfields and has placed significant military assents (O'Hanlon 2015, JakartaPost 2015). Beijing’s assertive discourse and actions were perceived as threatening by Jakarta. Due to China’s growing assertiveness, Jakarta felt that it could not continue to remain silent about the threat from China’s claims involving the SCS and, particularly, its alleged historical fishing rights in the NI territorial waters, so Indonesia became more assertive in protecting its regional interests. This was reflected in the fact that the media increasingly ran articles discussing NI security and sovereignty issues in 2015 (Figure 7). For example, in April 2015, six months after Jokowi became president, the Indonesian and US navies held joint military exercises around Batam Island, located about 300 miles from the NI (Kapoor and Fabi 2015). In addition, Indonesia’s Air Force Chief stated that Natuna should be developed as a military fortress to become Indonesia’s Pearl Harbour to ensure the protection of Indonesia’s soveignnity (Mollman 2015). As well as the military actions, President Joko Widodo launched a campaign to clamp down on illegal fishing and ordered the sinking of foreign trawlers, including Chinese ones. This was the first time that this had happened to China, resulting in Beijing rebuking Jakarta’s actions (FrancePresse 2015). Despite numerous political and military moves, in 2015, the language used by the Indonesian political and security elites was still not explicit and direct in discussing the potential threat that China’s expansionist ambitions in the SCS posed to Indonesia. The elites used symbolic and ambiguous language to discuss their sovereignty and legal concerns, while intermixing them with the importance of maintaining good relations with China. President Jokowi reaffirmed Indonesia’s neutrality in an interview published by the Jakarta Globe under the headline ‘Jokowi Clarifies: Indonesia Still Neutral in S. China Sea Dispute’ (Lumanauw 2015). Despite the nuanced language used by Jakarta, it increasingly acknowledged the challenges that China’s advances in the NI territorial waters represented for Indonesian territorial integrity. For example, TNI commander Moeldoko made public statements about the potential for instability created by China, apparently without consultation with the foreign ministry (Connelly 2015, 10-13). Moeldoko demanded a much more assertive approach by Jakarta to protect Indonesia’s interests around the Natunas, foreshadowing a reorientation of Jakarta’s approach to this conflict with China (Hamilton, Natasha dan McRae 2015, 14). By 2016, in particular after the incident with the Chinese coastguard in the NI waters in March of that year, China’s claim to have historical fishing rights within NI territorial waters was presented by Indonesian authorities as a major national security threat, i.e., the claim was securitized. This fact was also reflected in the hundreds of security-related articles run my Indonesia’s mainstream media in 2016 (Figure 7). The coastguard incident marked a radical change in Indonesia’s attitude towards China, the way that Beijing’s claims in the NI were discussed in Indonesia’s mainstream media, and the actions taken by Jakarta to protect their territorial sovereignty. Just because we are committed to maintaining a good relationship with China does not mean Indonesia is willing to sell out its waters. That is the delicate balance Jokowi is trying to tread - it needs to be made clear that the islands and waters surrounding the islands are ours. (Topsfield 2016). A second show of political and military force, lead by President Joko Widodo, was on 6 October 2016, when he chose to be absent from the important 71st Indonesian Military Anniversary to, instead, attend aerial military exercises by the Indonesian Airforce in the NI (F. Kuwado 2016). During this exercise, the Indonesian Air Force gathered most of its combat aircraft to play out a scenario in which Indonesia had to recapture an island from a hostile force. With such explicit actions, Jokowi asserted Jakarta’s intention to take any measures deemed necessary to protect Indonesia’s territorial integrity in the face of potential external aggression (Aspinall 2016, 74). With such explicit and assertive actions, the president also wanted to provide a robust context to the message that the media would send, both to Beijing and the Indonesian people, that Indonesia was not willing to negotiate its sovereignty over the NI territorial waters (Wijaya 2016). In addition, a coordinated move by the ministries of the Foreign Affairs, Defense, and Maritime Affairs and Fisheries confirmed that China’s claim to the NI represented a challenge to Indonesia’s sovereignty, further consolidating its securitization. To counter this existential threat, Jakarta allocated a large budget to upgrade the military installations responsible for the protection of Indonesia’s interests in the SCS (Japantimes 2016). The funds should be used to ‘strengthen the naval base in Natuna Islands’ to reinforce Indonesia’s sovereignty (Tashandra 2016) and to upgrade the Riau Islands Police station and increase its personnel from 5,000 to 12,000 to ensure that it can cope with the challenges presented by China’s assertive moves in the NI waters (Fadli 2017). Finally, a constructive impact of the swift securitization of the NI issue was that, after having been economically forgotten for decades, the economic development of the NI became a priority for the Indonesian government. Under the headline ‘President Jokowi wants priority for Natuna economic development,’ the President along with different ministers announced that the development of the NI was an urgent priority for the country (Antaranews 2016). Indeed, the need for the economic development of the NI had never been announced by Jakarta in terms of linking it to Indonesia’s security and sovereignty. If Jakarta wants to be successful in protecting its interests in the NI, it needs to consistenly reject China’s ‘traditional fishing grounds’ arguments, develop and improve the marine and military infrastructure in the region, and avoid empty political rethoric. The experience with the loss of two islands — Sipadan and Ligitan — to Malaysia, and also the dispute over Ambalat with that neighbouring country, has led Indonesia to now regard the security of its border areas as a priority (Sukma 2010). Malaysia won this dispute because it had institutionalized documentary evidence relating to its territory (Salleh 2008, Djalal 2013), which Indonesia still needs to do for the NI. After showing that between 2013 and 2016 Jakarta had swiftly securitized China’s claim to have historical fishing rights in NI territorial waters, this discussion will now assess whether this securitization argument was accepted by the Indonesian people. To do so, Indonesia’s social media outlets were surveyed over the same period to compare the people’s reactions to the news that appeared in the mainstream news outlets. Since the democratic reforms in 1998, Indonesian public opinion carries significant weight and strongly influences how politicians respond to events (Druce 2016). Thus, it is fundamental for Jakarta to convince the Indonesian people that their policies and use of resources are meaningful and necessary for Indonesia. To assess Jakarta’s success in convincing Indonesians that China’s claims to parts of the NI territorial waters represent a national security threat, we have conducted a survey of the reactions to the mainstream news found in Indonesian social media outlets. This quantitative survey has been organized by using a series of positive (tourism, economy, culture…) and negative or security-related (threat, illegal fishing, dispute…) keywords. As mentioned earlier, after plotting the number of tweets for the two groups of keywords (positive and negative) over the period from 2013 to 2016, two clear trends appeared (Figure 6). First, the positive group had its maxima in 2013 and rapidly decreased to reach its minima in late 2016. The second trend is that the negative/security-related group had its minima in 2013, to then increase in 2014 and 2015, and rapidly reach its maxima in late 2016. These two reverse trends explicitly show that the Indonesian people perceived the NI as a cultural, tourism, and economic issue in 2013, but then rapidly changing their view and perceiving them as national security threats by the end of 2016. Hence, Jakarta had been successful in convincing the Indonesian people that the Chinese aspirations in the NI waters represent an urgent national security threat. This fundamental change in the social media discourse is also reflected in the word clouds for 2013, 2015, and 2016 shown in Figures 8(a), (b), (c). These two tendencies indicate that in 2013-14 the Indonesian public opinion perceived the NI in terms of tourism, culture, and economic development, and not as a security issue. Then, after 2015, and particularly, after the incident with the Chinese coastguard in March 2016 in the NI territorial waters, the Indonesian people discussed the NI in terms of security, sovereignty, and illegal fishing. Figure 8: Social media keyword cloud evolution from 2013 to 2016. The convergence of official and social media discourses on NI is confirmed by both discourses being dominated by security-related keywords, such as territorial dispute, illegal fishing, and sovereignty, i.e., Jakarta had successfully securitized the NI issue. Just a few years ago, Indonesia was a friendly and supportive partner to China’s expansion in Southeast Asia, and played the role of ‘honest broker’ to help defuse tensions between China and the different claimants in the SCS. More recently, however, China’s assertive discourse and forceful actions in NI territorial waters have forced Indonesia to stand up to China’s advances and become more assertive in protecting its territorial sovereignty in the NI. The seriousness of this confrontation is reflected in the fact that Susi, Indonesia’s popular Marine and Fisheries Minister, threatened to bring China to the International Court of Justice (BBC-Indonesia 2016). By loosely adopting the securitization conceptual framework proposed by the CS and combining it with CDA, this paper describes how Jakarta successfully securitized the issue of China’s claims to have historical fishing rights in the territorial waters of the NI. A securitization process has been identified by using a combination of quantitative and qualitative methods to analyze the discourse produced by the Indonesian mainstream media involving the NI between 2013 and 2016. The results show that until the end of 2014, the NI were discussed in the media almost exclusively in cultural, social, and economic terms, to then increasingly being presented as being threatened by China’s territorial claims in 2015. Finally, in 2016, the Indonesian mainstream media explicitly framed China’s claims as threats to Indonesia’s territorial integrity and, thus, as an urgent national security threat, i.e., between 2013 and 2016, Jakarta securitized China’s claims to have historical fishing rights in the NI waters. To assess whether Jakarta’s securitization discourse was successful in convincing the Indonesian people that China’s claims in NI represented an existential threat, this analysis surveyed numerous popular Facebook and Twitter blogs between 2013 and 2016. The analysis showed a clear resonance between the official and social media discourses, confirming that Jakarta was successful in convincing the Indonesian people that China’s challenge in the NI represented an urgent national security threat, i.e., Jakarta successfully securitized the NI issue. To defuse its tensions with China, the Indonesian government needs to consistenly reject China’s traditional fishing grounds argument, develop the NI economy, and improve their marine and military infrastructure. It seems that Jakarta is already moving in this direction, which is reflected in the fact that President Jokowi and the relevant ministers intend to make the economic development of the NI an ‘urgent priority for the country’ (Antaranews 2016) and that a significant military buildup in the region is planned. Hopefully these plans will not just be empty political rethoric. It goes without saying that Jakarta must make sure that its vital relations with China do not significantly deteriorate because of the NI dispute. For this purpose, Jakarta and Beijing should approach their legal battle in a flexible and creative way (Eilenberg 2012), and avoid unnecessary and costly confrontations. China is, after all, Indonesia’s main trading partner, with exports amounting to 15 billion dollars, or 10% of Indonesia’s total exports (BPS 2017). Future research should address two key issues that were beyond the scope of this research. One is to provide insight into why there is a significant gap between what the Indonesian political and military elites think and what they can express in public. At times, there seems to be a significant discrepancy between the two. The second issue, which is a significantly more challenging one to analyze, is to explain why China has started to ignore its own traditional approach to diplomacy, which seeks to achieve harmonious international relations, and increasingly adopts a brute force approach in its disputes in the SCS. This issue was briefly discussed in an article published in The Diplomat under the headline ‘China's Non-Chinese Approach to the South China Sea’ (P. Meyer 2016), but clearly needs further research. ABC-News. 2016. "Indonesia's Government accuses Chinese coastguard of infringing on its waters." ABC News. 03 22. Accessed 02 01, 2017. http://www.abc.net.au/news/2016-03-21/indonesia-says-chinese-coast-guard-infringed-on-its-waters/7264368. Antara. 2016. Kompas. 03 Tuesday. http://internasional.kompas.com/read/2016/03/24/20114501/.China.Langgar.Hukum.Laut.di.Natuna.Protes.Keras.Indonesia.Dibenarkan. Antaranews. 2016. "President Jokowi wants priority for Natuna economic development." Antaranews.com. 06 23. Accessed 02 22, 2017. http://www.antaranews.com/en/news/105370/president-jokowi-wants-priority-for-natuna-economic-development. Aplianta, Derry. 2016. Indonesia's response in the South China Sea disputes: a comparative analysis of the Soeharto and the post-Soeharto era. MISC, 2015. Ministerial Meeting, MISC. Aritonang, M. 2014. "Govt takes small steps to protect Natuna." The Jakarta Post. 02 17. Accessed 02 20, 2017. http://www.thejakartapost.com/news/2014/02/17/govt-takes-small-steps-protect-natuna.html. —. 2014. "Govt takes small steps to protect Natuna." The Jakarta Post. 02 17. Accessed 02 20, 2017. http://www.thejakartapost.com/news/2014/02/17/govt-takes-small-steps-protect-natuna.html. Aspinall, Edward. 2016. "The New Nationalism in Indonesia." Asia & the Pacific Policy Studies 3, no. 1 69-79. Balzaq, T. 2005. "The Three Faces of Securitization: Political Agency, Audience and Context." European Journal of International Relations, 11 30. BBC. 2016. "Meeting in Natuna, President Jokowi asked for custody improved." BBC.com. 06 23. Accessed 02 21, 2017. http://www.bbc.com/indonesia/berita_indonesia/2016/06/160623_indonesian_jokowi_natuna_hasil. BBC-Indonesia. 2016. "Susi minister threatened to bring China to the International Court of Justice." www.bbc.com/Indonesia. 03 21. Accessed 02 01, 2017. http://www.bbc.com/indonesia/dunia/2016/03/160321_dunia_susi_kapal_cina. Beckman, Robert C, and Schofield H. Clive. 2014. "Defining EEZ claims from islands: A potential South China Sea change." The International Journal of Marine and Coastal Law 29, no. 2 193-243. BPS. 2017. Indonesian Export. Annual Report, Jakarta: BPS. Buol, A. R. 2014. "Klaim Tiongkok atas Paracell dan Spratly Ancam Keamanan Laut Indonesia." Kompass.com. 10 16. Accessed 02 20, 2017. http://nasional.kompas.com/read/2014/10/16/11480091/Klaim.Tiongkok.atas.Paracell.dan.Spratly.Ancam.Keamanan.Laut.Indonesia. Buzan, B., Weaver, O., and Wilde, J. D. 1998. Security : a new framework for analysis. Boulder, Colorado: Lynne Rienner Pub. Can, Yuan. 2016. People.cn -China reiterates its indisputable right over the South China Sea. 02 03. http://en.people.cn/n3/2016/0203/c90000-9013276.html. Chilton, P. A. 1996. Security metaphors : cold war discourse from containment to common house. New York: P. Lang. Connelly, Aaron L. 2015. Indonesian foreign policy under President Jokowi. Analysis, Lowy Institute. Djalal, Hasjim. 2013. "Dispute Between Indonesia and Malaysia On The Sovereignty Over Sipadan and Ligitan Islands." Jurnal Opinio Juris 12 (2013): 8-25 8-25. Djumena, E. 2016. "Jokowi Naik Kapal Perang di Natuna." Kompas.com. 06 23. Accessed 02 21, 2017. http://regional.kompas.com/read/2016/06/23/10130981/jokowi.naik.kapal.perang.di.natuna. Druce, Stephen C., and Efri Yoni Baikoeni. 2016. "Circumventing Conflict: The Indonesia–Malaysia Ambalat Block Dispute." In Contemporary Conflicts in Southeast Asia, by Mikio Oishi, 137-156. Singapore: Springer. Druce, Stephen C., and Efri Yoni Baikoeni. 2016. "Circumventing Conflict: The Indonesia–Malaysia Ambalat Block Dispute." In Contemporary Conflicts in Southeast Asia, 137-156. Singapore: Springer. Eilenberg, Michael. 2014. " "Frontier constellations: Agrarian expansion and sovereignty on the Indonesian-Malaysian border." ." Journal of Peasant Studies 41, no. 2 157-182. Eilenberg, Michael. 2012. At the edges of states; Dynamics of state formation in the Indonesian borderlands. Leiden: Brill. Fadli. 2017. "Natuna Brimob being prepared to anticipate South China Sea tension." Thejakartapost.com. 01 31. Accessed 02 22, 2017. http://www.thejakartapost.com/news/2017/01/31/natuna-brimob-being-prepared-to-anticipate-south-china-sea-tension.html. Fairclough, N. 2005. Critical Discourse Analysis. Fetherston, A. B. 2000. ". (2000) Peacekeeping, conflict resolution and peacebuilding: A reconsideration of theoretical frameworks." International Peacekeeping, 7 190-218. FrancePresse. 2015. "China unhappy after Indonesia sinks illegal fishermen's boats." ABS-CBS News. 05 22. Accessed 02 21, 2017. http://news.abs-cbn.com/global-filipino/world/05/21/15/china-unhappy-after-indonesia-sinks-illegal-fishermens-boats. Galiartha, G. 2014. "Anambas-Natuna lokasi paling rawan pencurian ikan." Antara News. 12 05. Accessed 02 20, 2017. http://www.antaranews.com/berita/467733/anambas-natuna-lokasi-paling-rawan-pencurian-ikan. Galiartha, Gilang. 2014. "Anambas-Natuna lokasi paling rawan pencurian ikan." Antaranews. 12 05. Accessed 02 20, 2017. http://www.antaranews.com/berita/467733/anambas-natuna-lokasi-paling-rawan-pencurian-ikan. Guardian, The. 2015. UN tribunal at The Hague to rule on rival claims to South China Sea islands. 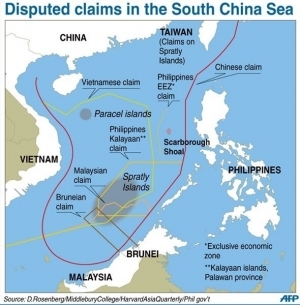 11 23. https://www.theguardian.com/world/2015/nov/23/south-china-sea-dispute-hague-competing-claims. Hakim, Syaiful. 2015. "TNI AL Kerahkan Tujuh KRI ke Natuna." Antaranews.com. 11 08. Accessed 02 20, 2017. http://www.antaranews.com/berita/528082/tni-al-kerahkan-tujuh-kri-ke-natuna. Hamilton, Hart, I Natasha, and Dave McRae. 2015. Indonesia: Balancing the United States and China, Aiming for Independence. Sidney: United States Studies Centre at the University of Sydney. Heiduk, Felix. 2016. Indonesia in ASEAN: regional leadership between ambition and ambiguity. Berlin: SWP. Jakarta Globe. 2016. Indonesia Sends Protest to China Over Natuna Islands Standoff. News, Jakarta: Jakarta Globe. JakartaGlobe. 2014. China Must Avoid Destabilizing Region, Indonesia Army Chief Says. News, Jakarta: Jakarta Globe. —. 2015. "Indonesia to Reinforce Border Areas Amid S. China Sea Tension." Jakartaglobe.com. Accessed 02 20, 2017. http://jakartaglobe.id/news/indonesia-reinforce-border-areas-amid-s-china-sea-tension/?utm_source=dlvr.it&utm_medium=twitter. —. 2014. "SBY Tells Troops: Indonesia an Asian Tiger in Ten Years." Jakartaglobe.id. 10. Accessed 02 20, 2017. http://jakartaglobe.id/news/sby-tells-troops-indonesia-asian-tiger-ten-years/. JakartaPost. 2015. "Conflict between US, China." Pressreader.com. 05 28. Accessed 02 21, 2017. https://www.google.co.id/url?sa=t&rct=j&q=&esrc=s&source=web&cd=4&cad=rja&uact=8&ved=0ahUKEwiLvazDhaHSAhUMMI8KHWRwBH0QFggxMAM&url=http%3A%2F%2Fwww.pressreader.com%2Findonesia%2Fthe-jakarta-post%2F20150528%2F281741268017698&usg=AFQjCNHRmdpEPyWYyakE-zksVw9e. —. 2014. "Tourism key to success for Natuna and Anambas." The Jakarta Post. 02 18. Accessed 02 21, 2017. http://www.thejakartapost.com/news/2014/02/18/tourism-key-success-natuna-and-anambas.html. Japantimes. 2016. "Indonesia set to upgrade military base in islands perched on edge of South China Sea." Japantimes.co.jp. 06 29. Accessed 02 22, 2017. http://www.japantimes.co.jp/news/2016/06/29/asia-pacific/indonesia-set-upgrade-military-base-islands-perched-edge-south-china-sea/. Kapoor , Kanupriya , and Randy Fabi . 2015. "Indonesia eyes regular navy exercises with U.S. in South China Sea." Reuters.com. 04 13. Accessed 02 13, 2017. http://www.reuters.com/article/us-indonesia-us-southchinasea-idUSKBN0N40O320150413. Kompas. 2016. "Beijing denies China Coast Guard Ships Violated Indonesia's Territorial Waters." Kompas.com. 03 21. Accessed 02 01, 2017. —. 2014. Dahlan: Push to Develop Tourism in Anambas. 05 05. Accessed 02 20, 2017. http://travel.kompas.com/read/2014/05/05/0853102/Dahlan.Dorong.BUMN.Kembangkan.Pariwisata.di.Anambas. —. 2016. "Minister Susi Rejects Chinese Government Claims Over Natuna Waters." Kompas.com. 03 22. Accessed 02 21, 2017. http://bisniskeuangan.kompas.com/read/2016/03/22/092556626/Menteri.Susi.Tidak.Terima.Klaim.Pemerintah.China.Atas.Perairan.Natuna. Krause, K., and Willias, M. C. 1997. Critical security studies concepts and cases. Borderlines. Minneapolis: University of Minnesota Press. Kuwado, F. 2016. "Pasca-Insiden dengan China, Indonesia Perkuat Pangkalan Laut Natuna." Kompas.com. 03 21. Accessed 02 22, 2017. http://nasional.kompas.com/read/2016/03/21/19513781/Pasca-Insiden.dengan.China.Indonesia.Perkuat.Pangkalan.Laut.Natuna. Kuwado, Fabian Januarius . 2016. Kompas. 08 29. Accessed 02 23, 2017. http://nasional.kompas.com/read/2016/08/29/17571841/jokowi.temui.xi.jinping.bahas.laut.china.selatan.dan.natuna. Kuwado, Fabian Januarius. 2016. Kompas. 03 Monday. http://nasional.kompas.com/read/2016/03/21/19513781/Pasca-Insiden.dengan.China.Indonesia.Perkuat.Pangkalan.Laut.Natuna. Laksmana, Evan. 2011. "Variations on a Theme: Dimensions of Ambivalence in Indonesia-China Relations." Harvard Asia Quarterly 13, no. 1 24. Liss, Carolin. 2013. "New Actors and the State: Addressing Maritime Security Threats in Southeast Asia." Contemporary Southeast Asia." A Journal of International and Strategic Affairs 35, no. 2 141-162. Lumanauw, Novy. 2015. "Jokowi Clarifies: Indonesia Still Neutral in S. China Sea Dispute." Jakartaglobe.id. 03 24. Accessed 02 21, 2017. http://jakartaglobe.id/news/jokowi-clarifies-indonesia-still-neutral-s-china-sea-dispute/. Marguerite, Afra Sapiie. 2016. "RI honest broker in South China Sea dispute: Defense Minister." The Jakarta Post. 06 13. Accessed 02 21, 2017. http://www.thejakartapost.com/news/2016/06/13/ri-honest-broker-in-south-china-sea-dispute-defense-minister.html. McGregor, S. L. 2003. Critical Discourse Analysis: A Primer. Critical Science And Critical Discourse Analysis. Meyer, P. 2012. "Governing Muslim Minorities as Security Threats: The Case of the Uyghurs and the Concept of a New Chinese Nation." PhD Thesis. University of Cambridge. Meyer, Patrik. 2016. "China's Non-Chinese Approach to the South China Sea." TheDiplomat.com. 09 03. Accessed 02 22, 2017. http://thediplomat.com/2016/09/chinas-non-chinese-approach-to-the-south-china-sea/. Moeldoko. 2014. "China’s Dismaying New Claims in the South China Sea." The Wall Street Journal, 04 24. Mollman, Steven. 2015. "Indonesia is building a “Pearl Harbor” in the South China Sea complete with fighter jets." QZ.com. 12 16. Accessed 02 21, 2017. https://qz.com/575189/indonesia-will-send-fighter-jets-to-its-pearl-harbor-in-the-south-china-sea/. Morton, Katherine. 2016. "China's ambition in the South China Sea: is a legitimate maritime order possible?" International Affairs 92, no. 4 909-940. O'Hanlon, Michael. 2015. "China’s Unsinkable Aircraft Carriers: While America builds carriers, China builds islands." The Wall Street Journal. 08 06. Accessed 02 21, 2017. https://www.wsj.com/articles/chinas-unsinkable-aircraft-carriers-1438880237. Panca, Hari Prabowo. 2014. "Antara News." Antaranews.com. 03 19. Accessed 02 01, 2017. http://www.antaranews.com/berita/424961/indonesia-pernah-sampaikan-keberatan-atas-peta-natuna. Parwitasari.w. 2016. Indonesia sees no basis for territorial dispute with China: Minister. News, Jakarta: Jakarta Post. Prabowo, D. 2016. Insiden Natuna Jadi "Warning" agar Pemerintah Lebih Serius Perkuat TNI. News, Jakarta: Kompas. Richardson, J. E. 2007. Analysing Newspapers: An Approach from Critical Discourse Analysis. Hampshire: Palgrave Macmillan. ROC, MF. 2015. Ministry of Foreign Affairs of the Republic of China. 05 26. Accessed 08 11, 2016. http://www.mofa.gov.tw/News_Content.aspx?n=604CBAA3DB3DDA11&sms=69594088D2AB9C50&s=4589151C339E71C5. Salleh, Noorzila. 2008. Boundary disputes researching archives. report, Kualalumpur: KLCC. Setijadi, Charlotte. 2016. "Ethnic Chinese in Contemporary Indonesia: Changing Identity Politics and the Paradox of Sinification." ISEAS.edu.sg. 03 17. Accessed 02 21, 2017. https://www.iseas.edu.sg/images/pdf/ISEAS_Perspective_2016_12.pdf. Stritzel, H. 2011. "Security, the translation." Security Dialoge 42 346-348. Stritzel, H. 2007. "Towards a Theory of Securitization: Copenhagen and Beyond." European Journal of International Relations, 13. 368-376. Sukma, R. 2010. "Indonesia’s Security Outlook, Defence Policy, and Regional Cooperation. Jakarta: Asia Pacific Countries’ Security Outlook and Its Implications for the Defense Sector. Sukmana, Yoga. 2016. Kompas. 03 Selasa. http://bisniskeuangan.kompas.com/read/2016/03/22/092556626/Menteri.Susi.Tidak.Terima.Klaim.Pemerintah.China.Atas.Perairan.Natuna. Supriyanto, Ristian Atriandi. 2015. Indonesia’s Natuna Islands: Next Flashpoint in the South China Sea? Commentary 033, S. Rajaratnam School of International Studies (RSIS). Supriyanto, Ristian Atriandi. 2012. "Indonesia's South China Sea dilemma: between neutrality and self-interest." Tashandra, N. 2016. "Komisi I DPR Setuju Pembangunan Pangkalan Militer di Natuna." Kompas.com. 06 28. Accessed 02 22, 2017. http://nasional.kompas.com/read/2016/06/28/12472491/komisi.i.dpr.setuju.pembangunan.pangkalan.militer.di.natuna. Topsfield, Jewel. 2016. "Indonesian president's visit to Natuna Islands sends waters warning to China." The Sydney Morning Herald. 06 24. Accessed 02 02, 2017. http://www.smh.com.au/world/indonesian-presidents-visit-to-natuna-islands-sends-waters-warning-to-china-20160623-gpqe8h.html. Vuori, J. A. 2008. "Illocutionary logic and strands of securitization: Applying the theory of securitization to the study of non-democratic political orders." European Journal of International Relations, 14 65-99.